I usually cave and buy boxes of granola snack bars so I have something easy to grab and go before I run out of the house, but either those are full of sugar or I'll have to splurge for the all natural bars that don't come cheap. This week, I'm making my own bars!! First key to this recipe is to have really plump, juicy Medjool dates. I got my dates from CostCo which were pretty fresh but you can also find these at your local farmer's market. If your dates aren't fresh, make sure to soak them in water for at least 30 minutes to rehydrate them. Next, toast your oats till they're nice and crunchy. I like to include honey, butter, a little brown sugar and salt with my oats. Toss them a few times in the oven to get a nice, even brown toasting on them. Let the toasted oats cool a bit so this is a great time to get started on the rest of your elements. Once you have all the pieces ready, place them all into a large mixing bowl and use your hands to incorporate all the elements. Make sure you REALLY get in there so the dates and almond butter mixture gets distributed.This is the most important part because it's what will help keep the bars sticking together so don't be lazy!! Keep mixing and pressing the oats with your fingers until you can feel it sticking together. Press the mixture into a 8" x 8" square pan lined with parchment paper. Press together so it's all evenly distributed on the bottom. Use a piece of plastic wrap to make sure it's really firmly set. Other optional items: Flax seed, other dried fruit like cranberries, cherries, chocolate chips, etc. Note, the more you add for dries, you may need more dates/honey to stick together. 1. Preheat your oven to 350 degrees F. In a small saucepan on medium heat, add butter and honey and melt until the two are incorporated. In a medium bowl, add rolled oats, brown sugar and salt. Pour the honey butter over the oats and mix together very well so oats are properly coated. 2. 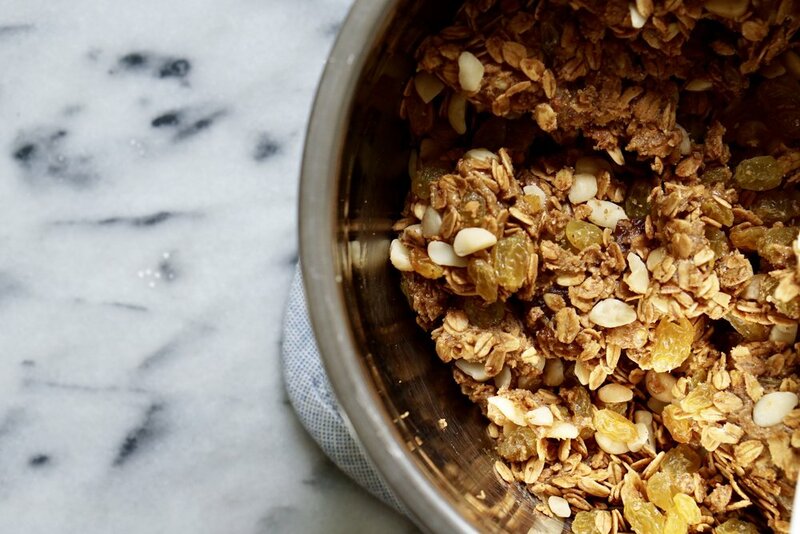 Transfer the coated oats on a small rimmed baking sheet. I used a quarter sized sheet. Toast until golden brown. Stir the oats every 10 minutes to ensure they brown evenly. Allow to cool for 5 minutes in the pan when you achieve the golden brown color. 3. While the oats are toasting, work on preparing the other elements. Add the dates into a food processor and puree until it becomes a large ball. You want this to be mushy and pureed throughly. 4. In the same small saucepan you used before, add almond butter and honey. Place on a low heat and mix until you can stir easily with a spatula. Make sure you don't over cook this! Set aside. 5. Place your mix-ins, slightly cooled toasted oats, almond butter mixture and pureed dates into the same medium bowl you used to mix the oats. Using your hands, mix all the elements together VERY WELL! Press the oat mixture through your fingers and keep mixing until the dates and almond butter has been throughly incorporated. This is what will allow your mixture to stick together so keep mixing until it can easily be squeezed into a ball of your hands. 6. Line an 8" x 8" square baking pan with parchment paper. Add the mixture into the pan and press firming and evenly across the bottom of the pan. Use a piece of plastic wrap to press down the mixture evenly. I've also used the bottom of a glass or measuring cup to ensure it's pressed in. 7. Chill in the fridge for 20 minutes or freezer for 15 minutes. Remove the parchment from the pan and cut into even bars. Wrap separately with plastic and enjoy within 5 days.